Supply Management: An Unfair Advantage or a System that Works? If you live in Canada, chances are you’ve heard or read multiple opinions about our supply managed dairy industry. I’d like to spend some time explaining what supply management is and how I feel it benefits all Canadians – consumers and farmers alike. Around the world, farmers face wild fluctuations in the price they are paid for the milk produced on their farms. Perhaps you’ve heard of the challenges currently facing British dairy farmers who cannot continue operations at the price they are currently paid for milk. This is not the case in Canada. Why? In the 1960s and early 1970s, the Canadian government and Canadian dairy farmers came to the conclusion that production discipline – balancing supply and demand for milk products – was necessary to avoid extreme market fluctuations. Both the federal and provincial governments worked together with farmers to implement a system that is adjusted to suit the needs of Canadian demand for dairy. The system is administered by the Canadian Dairy Commission, which measures the demand for milk and sets the production limits accordingly. Milk found in Canadian grocery stores is solely produced by Canadian dairy farmers for Canadian consumers. Milk is a local product, supporting local economies across our nation. The share of the market that each farm owns is called quota. Quota grants the farm a right to produce milk. The provincial quota is adjusted according to demand, and is increased or decreased as needed. Overproduction and waste are avoided because production is directly synchronized with consumer demand. Dairy farmers are paid a standard price for the milk they produce. This price is set by the Canadian Dairy Commission and is the result of a yearly national study of the cost of producing milk at the farm. Producers are paid the cost of producing the milk they ship to the processor. However, the retail price is influenced by more than the price paid to farmers. Processors and retailers can increase or decrease the price of milk in the stores to provide what they feel is a suitable margin of profit. It is also important to note that quota ensures the price of the raw milk produced on the farm, but not the income. If a farmer cannot produce the quota of milk, no payment is received. Just as in all farming, dairy farmers can be negatively impacted by crop failures, herd illness, natural disasters, etc. Milk quota does not protect farmers from these types of problems, but farmers in a supply managed system are just as subject to regular farming woes as any farmer from any country around the world. 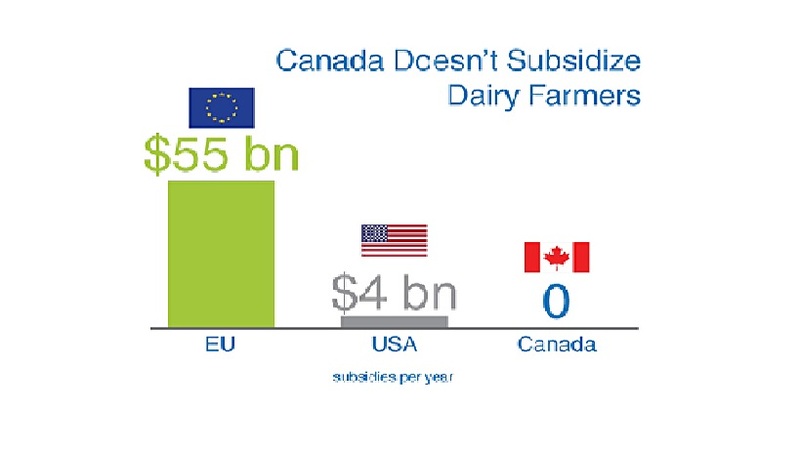 Additionally, Canadian farmers are not subsidized in any way, as is the case in most countries. So what’s the problem? As I mentioned earlier, there are various opinions about supply management. Critics of the system claim it makes milk products more expensive, blocks imports and is a barrier to trade. Some become rather indignant and antagonistic in their disagreement, calling supply management a “cartel of milk-fare bums receiving more than their fair share of government handouts”. Other critics complain that it is too difficult for aspiring farmers to obtain or purchase quota, making the system an “old-boys club”. Some lobby to have the industry deregulated, allowing imports from other countries to pour in. Allow me to explain why this is a terrible idea. Incidentally, many of the arguments I mentioned are myths, not realities. But what if the industry was deregulated? Surely that would result in lower prices for consumers, especially if farmers would no longer need to pay for costly quota to produce milk? NO! 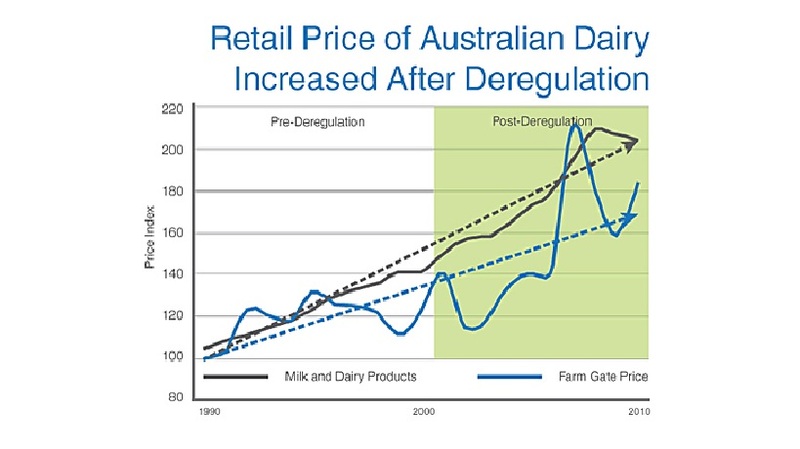 History has shown both in the UK and Australia that after deregulation, amounts paid to farmers decreased, but retail prices INCREASED! In Australia, prices for milk rose 27 cents/L in the three years after deregulation, as opposed to 9 cents/L in the three years before deregulation. 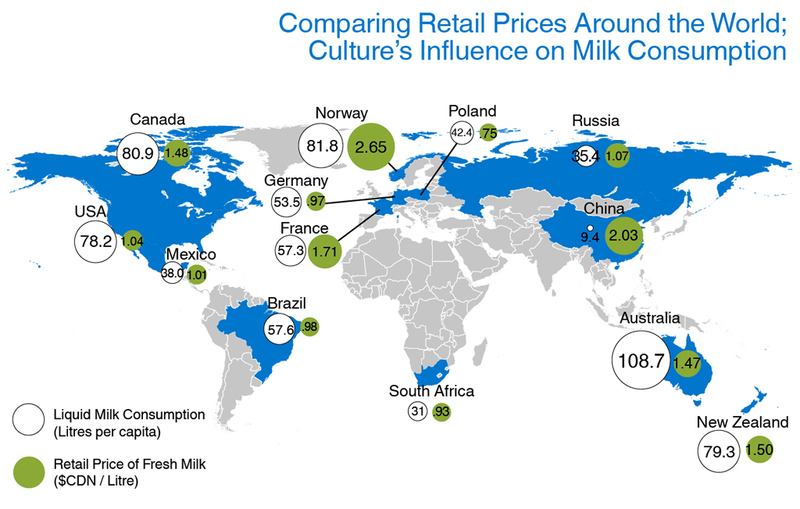 Additionally, in New Zealand, known as the most competitive milk producing country in the world, the price of milk in the stores is very comparable to here in Canada. Abolishing supply management would be extremely detrimental to farmers’ incomes and would likely result in government subsidies paid to farmers, but probably would not benefit the consumer at all. EDIT (Dec. 10, 2014): Recently, news sources have been full of news about the milk crisis in New Zealand. Global milk prices have plunged due to Russia blocking dairy imports from the EU and China importing less milk, both of which have led to a global surplus of milk, causing prices to halve since last February. Farmers in New Zealand are being paid less than the price of production now, BUT retail prices of milk have remained the same – higher than the prices Canadian consumers pay. At the moment, both consumers and farmers can be thankful for our supply managed system! Does supply management hinder trade agreements and block imports of foreign produced milk products? NO! Since 1986, many trade agreements have been signed by Canada, including NAFTA , EFTA, and, recently, CETA. Canada is also participating in TPP (Trans-Pacific Partnership) talks. Supply management has been brought up at these agreements, but has not yet hindered an agreement’s successful completion. 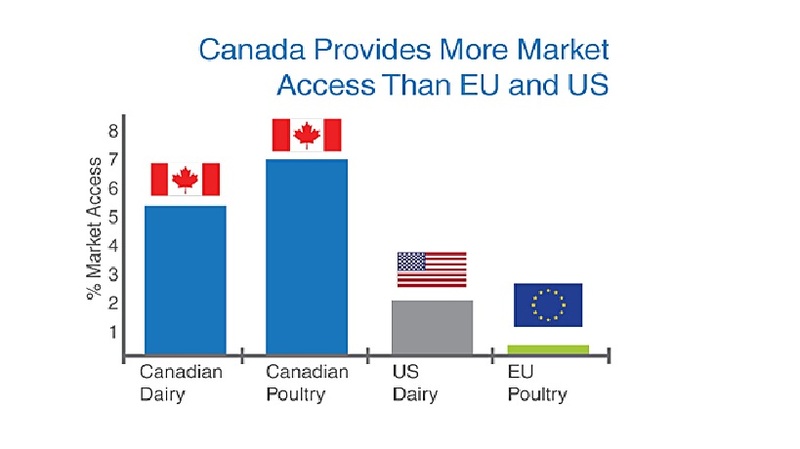 You may also be surprised to learn that Canada gives access to quite a slice of imported dairy products – more than 6%. Interestingly, countries that are known to be “free trade friendly”, such as the US, import less (2.75% in the US). Of course, the cost of quota does make the process of beginning a dairy farm more difficult. In Canada, many farms are handed down though the generations, allowing the younger generation to continue on the family farm, gradually assuming the debt burden. However, most provinces have implemented an entrance program for aspiring farmers. The programs allot a certain amount of quota to farmers wishing to enter the industry, giving them a “leg up” into the industry, helping them to start out on their own. The value of the quota received is paid back over a number of years, or (in some provinces, including here in BC) belongs to the farmer free and clear after 10 years. And, as always, if you have questions, please feel free to voice them in the comments section below. To conclude, I’ll leave you with the voice of Canadian dairy farmers: “We support supply management… because it works!” I hope you agree.